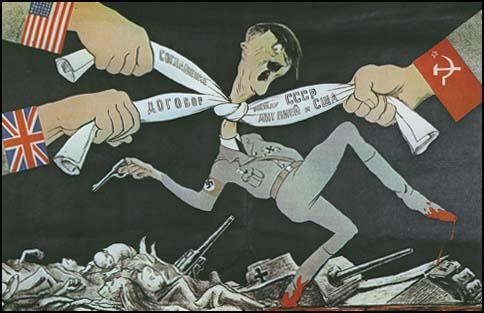 At the beginning of 1945 the Soviet troops entered Nazi Germany. On 16th January, Hitler moved into the Führerbunker in Berlin. He was joined by Eva Braun, Gretl Braun, Joseph Goebbels, Magda Goebbels, Hermann Fegelein, Rochus Misch, Martin Bormann, Arthur Bormann, Walter Hewell, Julius Schaub, Erich Kempka, Heinz Linge, Ernst-Gunther Schenck, Otto Günsche, Traudl Junge, Christa Schroeder and Johanna Wolf. 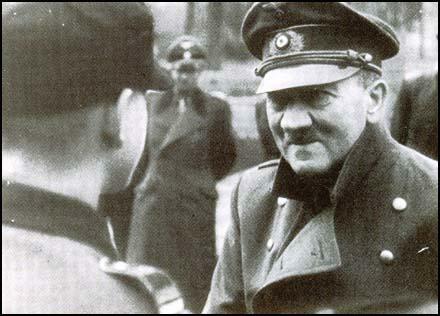 Hitler was now nearly fifty-five years old but looked much older. His hair had gone grey, his body was stooped, and he had difficulty in walking. His voice had become feeble and his eyesight was so poor that that he needed special lenses even to read documents from his "Führer typewriter". Hitler also developed a tremor in his left arm and leg. He had originally suffered from this during the First World War and also after the failure of the Munich Putsch in 1923. It was a nervous disorder that reappeared whenever Hitler felt he was in danger. The situation became so desperate that on 22nd April, Hitler sent Christa Schroeder, Johanna Wolf, Arthur Bormann, Dr. Theodor Morell, Admiral Karl-Jesco von Puttkamer and Dr. Hugo Blaschke, away. Schroeder later recalled: "He received us in his room looking tired, pale and listless. "Over the last four days the situation has changed to such an extent that I find myself forced to disperse my staff. As you are the longest serving, you will go first. In an hour a car leaves for Munich." On 28th April, Heinrich Himmler, involved in secret negotiations with Count Folke Bernadotte, claimed that Hitler intended to commit suicide in the next few days: "In the situation that has now arisen I consider my hands free. I admit that Germany is defeated. In order to save as great a part of Germany as possible from a Russian invasion I am willing to capitulate on the Western Front in order to enable the Western Allies to advance rapidly towards the east. But I am not prepared to capitulate on the Eastern Front." Bernadotte passed this message to onto Winston Churchill and Harry S. Truman but they rejected the idea, insisting on unconditional surrender. On 28th April the negotiations were leaked to the press. Hanna Reitsch was with Hitler when he heard the news: "His colour rose to a heated red and his face was unrecognizable... After the lengthy outburst, Hitler sank into a stupor, and for a time the entire bunker was silent." Hitler ordered Himmler's arrest. In an attempt to escape Himmler now took the name and documents of a dead village policeman. When the Soviet troops first entered Berlin it was suggested that Hitler should try to escape. Hitler rejected the idea as he feared the possibility of being captured. He had heard stories of how the Soviet troops planned to parade him through the streets of Germany in a cage. To prevent this humiliation Hitler decided to commit suicide. By the end of April soldiers of the Red Army were only 300 yards away from Hitler's underground bunker. Although defeat was inevitable, Hitler insisted his troops fight to the death. Instructions were constantly being sent out giving orders for the execution of any military commanders who retreated. Hitler made a will leaving all his property to the Nazi Party. On 28th April 1945 Hitler married Eva Braun. Hitler tested out a cyanide pill on his pet Alsatian dog, Blondi. Braun agreed to commit suicide with him. She could have become rich by writing her memoirs but she preferred not to live without Hitler. Braun told Hitler's secretary, Traudl Junge. "Please do try to get out. You may yet make your way through. And give Bavaria my love." Junge commented that she said this "smiling but with a sob in her voice." Himmler summarises the situation correctly when he says that his mind tells him that we have little hope of winning the war militarily but instinct tells him that sooner or later some political opening will emerge to swing it in our favour. Himmler thinks this more likely in the West than the East. He thinks that England will come to her senses, which I rather doubt. As his remarks show, Himmler is entirely Western-oriented; from the East he expects nothing whatsoever. I still think that something is more likely to be achieved in the East since Stalin seems to me more realistic than the trigger-happy Anglo-American (Roosevelt). Hitler declared that he had decided to stay in Berlin, lead its defence and then at the last moment shoot himself. For physical reasons he was unable to take part in the fighting personally, nor did he wish to, for he could not run the risk of falling into enemy hands. We all attempted to bring him over from this decision and even offered to move troops from the west to fight in the east. His answer was that everything was falling to pieces anyway, and that he could do no more. Hanna, you belong to those who will die with me. Each of us has a vial of poison such as this. I do not wish that one of us falls into the hands of the Russians alive, nor do I wish our bodies to be found by them. (Source 6) Count Folke Bernadotte sent a message to the Winston Churchill on what Heinrich Himmler had told him on 24th April, 1945. In the situation that has now arisen I consider my hands free. I admit that Germany is defeated. In order to save as great a part of Germany as possible from a Russian invasion I am willing to capitulate on the Western Front in order to enable the Western Allies to advance rapidly towards the east. But I am not prepared to capitulate on the Eastern Front. On 27th April Count Bernadotte returned from the north with the news that the Western Allies refused to consider a separate peace and insisted on unconditional surrender... Hitler was beside himself at the news... It served to crystallize the decision to commit suicide which Hitler had threatened on the 22nd, but which he had not yet made up his mind to put into effect. This final decision followed the pattern of all the others: a period of hesitation, then a sudden resolution from which he was not to be moved. It was towards midday on 30 April 1945. Russian shelling was hitting the Reich Chancellery and the government district continuously. The struggle to hold out had become fiercer. With a thunder and a crack, whole blocks of dwellings collapsed, and the streets around the Reich Chancellery were reduced to deserts of rubble. The Führer took his leave of his staff, shaking the hand of each and thanking them for their work and loyalty to him. Secretaries Frau Junge, Frau Christian and the dietician-cook Fraulein Manziarly were invited to lunch. Hitler sat next to his wife. As he had done in the good times, he tried to keep the conversation unforced, with everybody participating. When this last meal had ended and the three ladies had withdrawn, Hitler had them recalled by his adjutant SS-Sturmbannfuhrer Otto Günsche. In the doorway to his ante-chamber, he and Eva Braun took their leave of the three again. Frau Hitler embraced the long-scriving secretaries and shook the hand of all three in parting. Hitler also said farewell to Bormann and his SS adjutant Günsche. The latter received an express order to contact me and arrange for enough fuel to immolate the bodies of Hitler and his wife: "I do not wish to be displayed after my death in a Russian panopticon like Lenin." When I entered, Hitler was thanking her for her commitment and services. He asked me to remove the gold Party badge from one of his uniforms and pinned it on her in "especial recognition". Immediately after this Hitler and I went into the common room where Goebbels appeared and begged Hitler briefly to allow the Hitler Youth to take him out of Berlin. Hitler responded brusquely: "Doctor, you know my decision. There is no change! You can of course leave Berlin with your family." Goebbels, standing proudly, replied that he would not do so. Like the Führer he intended to stay in Berlin - and die there. At that Hitler gave Goebbels his hand and, leaning on me, returned to his room. Only when Eva Braun comes over to me is the spell broken a little. She smiles and embraces me. "Please do try to get out. You may yet make your way through. And give Bavaria my love," she says, smiling but with a sob in her voice. She is wearing the Führer's favourite dress, the black one with the roses at the neckline, and her hair is washed and beautifully done. Like that, she follows the Führer into his room - and to her death. The heavy iron door closes. I am suddenly seized by a wild urge to get as far away from here as possible. I almost race up the stairs leading to the upper part of the bunker. But the Goebbels children are sitting halfway up, looking lost. They felt they'd been forgotten in their room. No one gave them any lunch today. Now they want to go and find their parents, and Auntie Eva and Uncle Hitler. I lead them to the round table. "Come along, children, I'll get you something to eat. The grown-ups have so much to do today that they don't have any spare time for you," I say as lightly and calmly as I can. I find ajar of cherries, butter some bread and feed the little ones. I talk to them to distract them. They say something about being safe in the bunker, and how it's almost fun to hear the explosions when they know the bangs can't hurt them. Suddenly there is the sound of a shot, so loud, so close that we all fall silent. It echoes on through all the rooms. "That was a direct hit," cried Helmut, with no idea how right he is. The Führer is dead now. 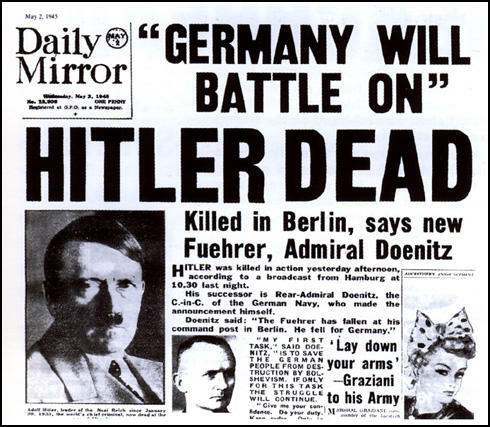 (Source 12) The Daily Mirror reporting the death of Adolf Hitler (2nd May, 1945). My beloved son! By now we have been in the Führerbunker for six days already - daddy, your six little siblings and I, for the sake of giving our national socialistic lives the only possible honorable end... You shall know that I stayed here against daddy's will, and that even on last Sunday the Führer wanted to help me to get out. You know your mother — we have the same blood, for me there was no wavering. Our glorious idea is ruined and with it everything beautiful and marvelous that I have known in my life. The world that comes after the Führer and national socialism is not any longer worth living in and therefore I took the children with me, for they are too good for the life that would follow, and a merciful God will understand me when I will give them the salvation... The children are wonderful... there never is a word of complaint nor crying. The impacts are shaking the bunker. The elder kids cover the younger ones, their presence is a blessing and they are making the Führer smile once in a while. May God help that I have the strength to perform the last and hardest. We only have one goal left: loyalty to the Führer even in death. Harald, my dear son - I want to give you what I learned in life: be loyal! Loyal to yourself, loyal to the people and loyal to your country ... Be proud of us and try to keep us in dear memory. (Source 14) Helga, Hilde, Helmut, Holde and Hedda Goebbels in 1940. It was Magda who saw to the murder of her own children. She had already conferred several times with the SS doctors Ludwig Stumpfegger and Helmut Gustav Kunz of the Reich Chancellery staff about how the children could be killed quickly and painlessly. Now, on the afternoon of 1st May, she had Kunz sent to her in the bunker. The decision had been made, she told him, and Goebbels thanked him for helping his wife "put the children to sleep." Around 8:40 p.m. Kunz gave the children morphine injections. He left the room with the three sets of bunk beds and waited with Magda Goebbels until the children were asleep. Then she asked him to give them the poison. Kunz refused, however, and was then sent by Magda Goebbels to fetch Stumpfegger. When Kunz came back with him, Magda was already in the children's room. Stumpfegger joined her there, and came back out with her after four or five minutes. In all likelihood she herself had broken the glass cyanide capsules, which she had received from Dr. Morell, in the mouths of Helga, Hilde, Helmut, Holde, Hedda, and Heide. 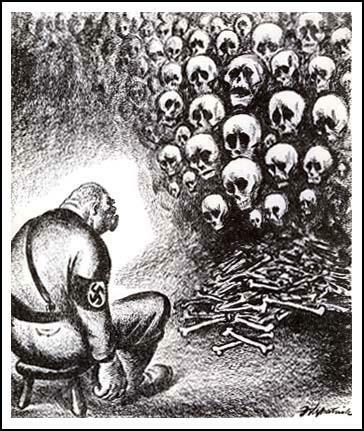 Filled with fear of death, Goebbels was chain-smoking, his face covered with red blotches. Apparently still hoping for a miracle, he kept asking about the military situation. When time ran short, and the Soviets could be expected to storm the bunker at any moment, he made his adjutant Schwagermann promise to cremate both his and his wife's bodies. Then he took leave of those remaining in the bunker. He was clearly struggling to maintain his composure, which he tried to demonstrate with all sorts of bathetic flourishes. "Tell Donitz," he is reported to have instructed the chief pilot of Hitler's squadron, "that we understood not only how to live and to fight but also how to die." The last details regarding the deaths of Joseph and Magda Goebbels will probably always remain unclear. It is certain that they poisoned themselves with cyanide, but it is not known whether Goebbels also shot himself in the head. Nor do we know whether they died in the bunker or outside at the emergency exit, where the Soviets found their bodies. For Dr Joseph Goebbels, the new Reich Chancellor, it was not apparent until now that he and his wife Magda would commit suicide in Berlin this same day. After the experiences of recent days and weeks hardly anything could shock us men any more, but the women, the female secretaries and chambermaids were 'programmed' differently. 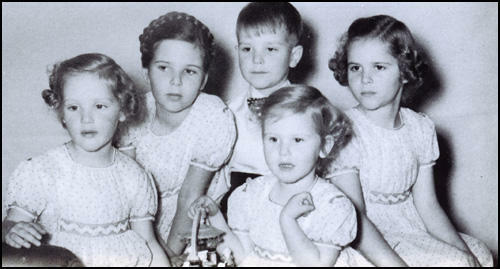 They were fearful that the six beautiful Goebbels children would be killed beforehand. The parents had decided upon this course of action. Hitler's physician Dr Stumpfegger was to see to it. The imploring pleas of the women and some of the staff, who suggested to Frau Goebbels that they would bring the children - Helga, Holde, Hilde, Heide, Hedda and Helmut - out of the bunker and care for them, went unheard. 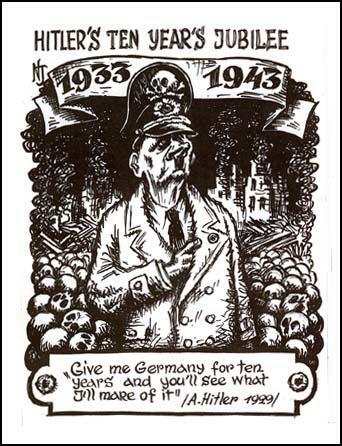 I was thinking about my own wife and children who were in relative safety when Frau Goebbels came at 1800 hours and asked me in a dry, emotional voice to go up with her to the former Führerbunker where a room had been set up for her children. Once there she sank down in an armchair. She did not enter the children's room, but waited nervously until the door opened and Dr. Stumpfegger came out. Their eyes met, Magda Goebbels stood up, silent and trembling. When the SS doctor nodded emotionally without speaking, she collapsed. It was done. The children lay dead in their beds, poisoned with cyanide. Two men of the SS bodyguard standing near the entrance led Frau Goebbels to her room in the Führerbunker. Two and a half hours later both she and her husband were dead. The last act had begun. Question 1: Study sources 1, 10 and 17. Explain the message being expressed in these sources. Question 2: Study sources 2, 6 and 7. What did Heinrich Himmler offer Winston Churchill and Harry S. Truman? Why did they refuse this offer? Question 3: Using all the information in this unit, explain why Adolf Hitler decided to commit suicide on 30th April, 1945? Question 4: Why did Joseph Goebbels and Magna Goebbels kill their children before committing suicide? Question 5: Write a brief account of what happened to the following after they left Hitler's bunker: Gretl Braun, Hermann Fegelein, Rochus Misch, Martin Bormann, Arthur Bormann, Walter Hewell, Julius Schaub, Erich Kempka, Heinz Linge, Ernst-Gunther Schenck, Otto Günsche, Traudl Junge, Christa Schroeder and Johanna Wolf. Question 6: Using the information in this unit explain what kind of sources historians would use when writing about the last days of Adolf Hitler.